Traversing some of Africa’s most iconic landscapes and set to the backdrop of Mt Meru and the magnificent Mt Kilimanjaro; horse riding in Tanzania promises an unforgettable experience. 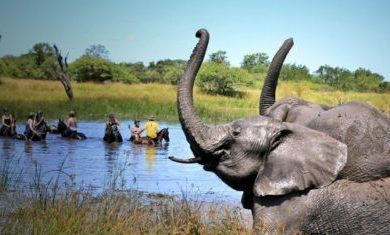 As you return to a ‘safari of old’, following in the footsteps of the majestic African elephants, you will be astounded by the spectacular beauty of the African bush. Explore some of the last true wildernesses on earth, as you become part of a herd of cantering zebra, creep up on a munching elephant or gaze up in wonder at a tall giraffe. 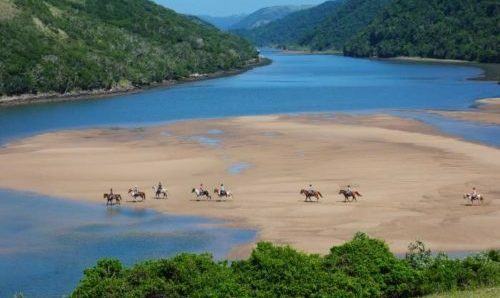 Trail riding, with the assistance of a mobile camp set-up, and spending 8 nights watching sunsets, sitting round campfires and sleeping out in the wilderness will be an adventure like no other. 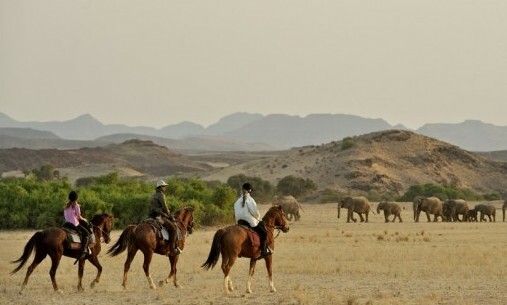 With fabulous varied riding terrain, you will pass through savannah grasslands, forest canopies and thick scrub – riding in Arusha National Park for part of your trip. 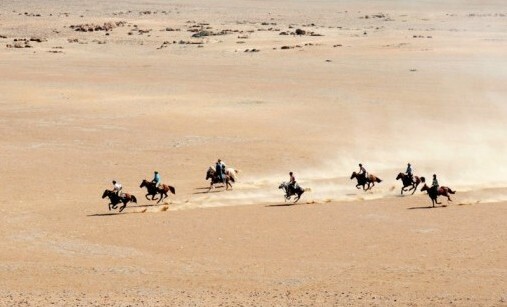 Ride alongside game and enjoy the thrilling experience of cantering next to some passing wildebeest. You are likely to encounter giraffe, zebra, elephant and plenty of plains game – maybe even some big cats if you are lucky. You will take on this challenge with the help of a fit and responsive four-legged friend. 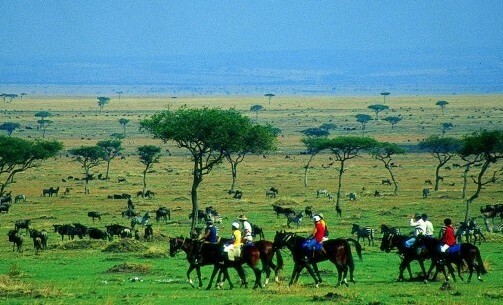 This riding holiday in Tanzania is for experienced riders only as you will be riding in areas with big game. 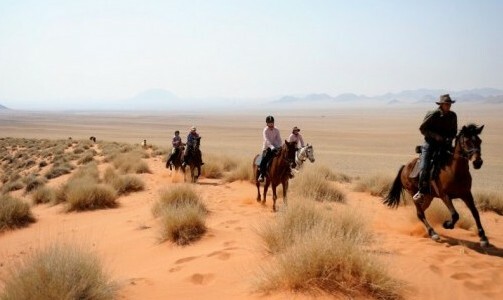 The Enduimet Wildlife Management Area (EWMA) was formed in 2007 and covers 1,280sq km of land. The area is situated in the Longido District, near to the Tanzania-Kenya border, and provides an essential trans-national migratory route and dispersal area for many fauna including the African Elephant. The EWMA is the only corridor that connects to the Kilimanjaro Ecosystem, and is extremely important in creating a safe haven for Tanzania’s wildlife to pass through. Please note that this is a sample itinerary and not a guarantee - wildlife determines your daily activities. Day 1: Arrival at Kilimanjaro International Airport followed by a short transfer to your first base for the night - the Polo Safari Club. Located on a wildlife estate with great views of Mt Meru, and on a clear day Mt Kilimanjaro, the camp overlooks the polo club house and two polo fields where often zebras and wildebeests are seen grazing. You will enjoy the first night of your trip and get to know your fellow adventurers! Over dinner you will be joined by the lead guide who will give a quick introduction and an overview of what to expect during the course of your safari. Day 2: Breakfast is served anytime from early hours. At around 11.00AM, take a short 20 minute drive to Arusha National Park gate. 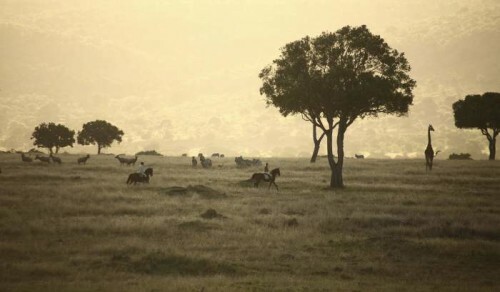 Here the horses will be waiting, ready for you to ride into one of the most beautiful parks in East Africa. Here the vegetation will change dramatically, from open grassland to rain forest. There are good chances here of seeing elephants, buffaloes and other plains game, as well as leopards, rare species such as Suni, Red Duiker and an array of birdlife. The feeling is magical as you enter into the big canopy forests. Lunch will be set en route, with time for a small siesta. After lunch the ride continues through leopard country and as you head towards the night stop, passing by Margarete Trappe’s old house. The legendary lady known and remembered as the Iron lady from the first world war. These are some of the tales about Margarete who’s old riding paths this safari follows through the holy forests of the park. Arrive to camp, based on the foot of Mt Meru in time for showers and sundowners then dinner under the stars. Day 3: This morning you will hopefully wake up to the very talkative Columbus monkeys. Breakfast is served and shortly thereafter you mount and directions are taken towards the area where the film Hatari was filmed, starring John Wayne. Half way into the morning ride, start the climb (on horseback), aiming to reach the “Fig Tree Arch”, big enough to fit five horses underneath it. The ride continues until lunch, beautifully located in the rain forest next to a waterfall. You are now at about 2000 meters above sea level. After lunch start heading back towards camp, passing by another 30-meter waterfall along the way. After returning to camp, there will be the option to jump into the vehicles and go visit the Momella lakes, where you will hopefully see some hippos and beautiful water birds. Sundowners at the lakes before heading back to camp for showers and dinner. Day 4: You wake up with the sun and a big breakfast is served before it is time to ride out of Arusha National Park. You will be travelling eastbound towards Mount Kilimanjaro and leaving Mount Meru behind you like a shadow. The days ride is long, amongst Tanzanian farmland and the Massai steppe, with many cultural interactions as the ride progresses. Make use of the cooler hours in the morning and try to cover as much ground as possible. Lunch is served under the shade of a big acacia, sometimes nearby a dam where the Massai’s water their cattle and you your horses. You will have a good 3 hour’s stop for lunch, with time for a siesta to regain some strength. The afternoon ride is back into wildlife areas and across open plains, making sure to reach our night stop before the sun hits the horizon. Day 5: Early wake up with coffee and tea before a bush breakfast is served. 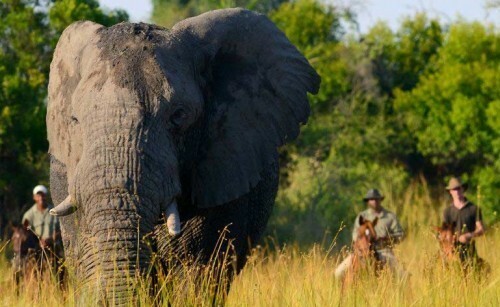 The day will be spent tracking the biggest land living mammal, the African elephant. The terrain differs from thick scrub to acacia woodland. Today you will return to camp for lunch and head out for another ride in the afternoon. Before sunset, return to camp to enjoy another night in this remote and remarkable place on earth. Day 6: Early wake up calls followed by an English breakfast. 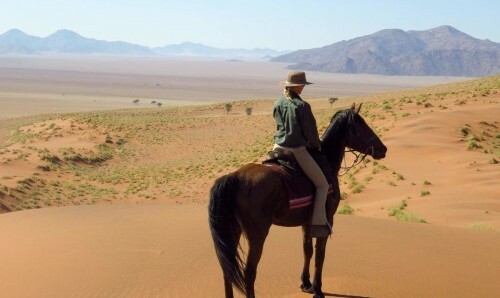 You will mount your horses and the safari heads towards the aptly named Seven Sisters hills. After crossing the hills, ride through Sinya Village and continue until lunch, served under a shady tree. The terrain varies from opened grassland to beautiful canopy forests. The day offers good chance of seeing plains game such as zebra, giraffe and wildebeest but most important is the presence of the shy antelope, the Gerenuk that you will keep an eye out for as you ride. The night is spent at a stunning camp, hopefully the night is clear and you will get the feeling being watched by four powerful mountains, Mt Meru, Namanga, Longido and the most legendary of all, Mt Kilimanjaro. Day 7: Wake up with the sun before riding out, headed towards the Kenyan border. This day will be spent tracking the footsteps of the elephant. Hopefully we have good luck tracking and get the chance to see these giants from the back of a horse. The night will be spent overlooking the pans with its plains game on constant alert for predators. Hopefully the night is clear, as apart from the view of the mountain landscape, the night sky is absolutely breathtaking. Day 8: The last morning and your safari has come to an end. Enjoy a big breakfast before heading back towards civilization, depending on road conditions it is about 3 hours back to the airport. For those who fly out late there is a day room available at the Polo Club. Embrace bush life with this tented fly camp; you will have a comfortable and spacious tent which has a removable bottom section, revealing 360 views if you wish. The mosquito lining keeps your tent insect proof but allows for ventilation. Each tent has scissor beds, cotton linen, a solar light and outside there is a chair and a wash stand. Each tent has its own bush toilet and bucket shower. The toilet is a traditional short drop style toilet. The shower is a traditional star gazing canvas bucket, suspended from a tree inside the shower enclosure. 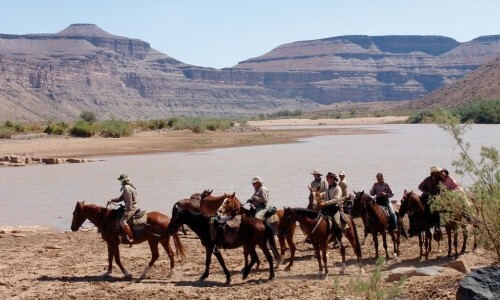 You will be moving camp regularly and at each sight the on ground team will go ahead of you, and have camp set up by the time you ride in that day.